This is an annotated and hand-picked list of algebra tutorials, lessons, worksheets, games, word problems, and algebra books. It is a very long list, and includes a great variety of resources. I have personally chosen each website to make sure it is truly useful for my visitors! My own article that lists options for pre-algebra curriculum for homeschoolers, including descriptions of textbooks. My own article that lists options for algebra curriculum for homeschoolers, including detailed descriptions of four textbooks. Practical algebra lessons with lots of pictures and animations and worked-out examples. Free learning guides (tutorials) for all prealgebra topics with interactive practice problems, step-by-step examples, graphs, and real-world applications. This can be used for an online pre-algebra textbook. Attend Professor Perez's virtual classroom alongside his favorite student, Charlie. Class notes, video lectures, and video worksheets that mirror the video lectures. Some videos are close captioned. A website with some simple algebra lessons for typical Algebra 1 class. Each lesson has a brief introduction followed by several examples with detailed explanations, and then a few practice problems. Tutorials with exercises; with mouseover the answer is revealed. High-quality free video lessons with interactive questions covering high school algebra, calculus, physics and many other high school subjects. Quite a complete list of algebra lessons from Interactive Mathematics. Each section has an interactive quiz. Algebra is often taught abstractly with little or no emphasis on what algebra is or how it can be used to solve real problems. Just as English can be translated into other languages, word problems can be "translated" into the math language of algebra and easily solved. Real World Algebra explains this process in an easy to understand format using cartoons and drawings. This makes self-learning easy for both the student and any teacher who never did quite understand algebra. Includes chapters on algebra and money, algebra and geometry, algebra and physics, algebra and levers and many more. Designed for children in grades 4-9 with higher math ability and interest but could be used by older students and adults as well. Contains 22 chapters with instruction and problems at three levels of difficulty. No more PEMDAS—this method uses brackets to help you figure out in what order and how to simplify expressions. Math review material—text-book type explanations. Their cyberboard has lots of questions and answers on high school and college level math problems. Free algebra text and video lessons. Free and subscription online pre-algebra and algebra course that includes step-by-step narrated tutorials, videos, and online quizzes. Watch free Flash tutorials about algebra. Easy to navigate. Lots of solved examples for algebra 1 and especially algebra 2 topics. Includes study tips and videos on graphing and basic algebra 1 topics. Algebra 2 Video Lessons Includes online video lessons and other support materials to accompany Holt Algebra 2 textbook. Click on the Homework help, choose a chapter, and then view the lessons. 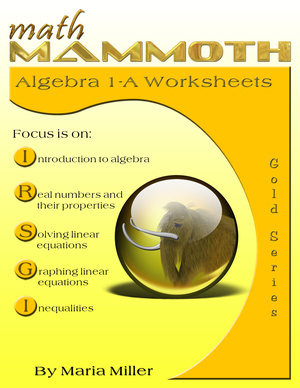 Explanations of basic algebra concepts, lots of worksheets where you can check the solutions. including prerequisites for college algebra (= high school algebra) and college algebra topics both. Step-by-step instructions, lots of worked out examples, also some practice problems with answers. Over 6,000 free, online video lessons for basic math, algebra, trigonometry, and calculus. Videos also available in Spanish. Also includes online textbooks. I've written a review of MathTV lessons when they used to be offered on CDs. Online curriculum and math learning system. Includes videos lessons, course materials, review notes, practice worksheets, tests and answer keys. Courses offered are prealgebra, algebra 1 & 2, intermediate and college algebra, and GED math. $25/month or $180 a year. Free trial available. About 30 interactive explorations for algebra 1. The activities include dynamic online sketches and graphs and center on real-life situations. Examples and interactive practice problems on a host of algebra topics. For each topic you get a change to practice yourself with computer-checked problems. Includes video and text lessons with self-grading quizzes from linear equations to exponential & logarithmic functions and sequences & series. The lessons can also prepare you to earn the lowest-cost college credit in the U.S.
A DVD that includes short movies, showing how algebra is used in the real world, plus supplemental activities & lesson plans. Also available as an online subscription. The DVD costs $95. Algebra tiles are manipulatives that visualize many basic concepts of algebra. This site has instructions how to make them and links to pages with info how to use them. A lesson plan explaining how "algebra tiles" help visualize common factoring rules. It is very illustrative, bringing the abstract down to a concrete level. Covering all algebra topics, an extensive collection of 'gizmos' or interactive visual illustrations. They are like virtual hands-on manipulatives with exploration guides (means you have the lesson plan ready there) and assessment questions. Excellent site! Free trial. Interactive and simple algebra tutorials and worksheets. Series of 10 tutorials (modules) that illustrate how mathematics is used in real-world applications. The student tutorials are printable and ready-to-use pdf-files. The teacher resources have background info, case studies of real companies, homework exercises, and more. For those who want to know where mathematics is actually used, and how. Topics include systems of inequalities, probability & simulation, and finding shortest route among others. Thirty complete lesson plans with real-life examples, exercises, and solutions. Ten of them are free! A two-part collection (A and B) of 137 quality algebra worksheets covering all the topics in a typical algebra 1 curriculum. These worksheets are hand-crafted and contain lots of word problems and other variable problems. Free samples available. $13.50. Includes worksheets for a variety of topics: simplifying expressions, solving equations, graphing, integers, percent, proportions, ratio, pi, and more. The worksheets are randomly generated and printable from your browser. Worksheets for linear equations. Includes one-step, two-step, multi-step equations, variable on both sides, and more. Available both as PDF and html files. Worksheets for linear inequalities. Graph a given inequality, write the inequality from the graph, solve an inequality in a given set, and solve various types of linear inequalities. Available both as PDF and html files. You can control the number of problems, difficulty level, the type of expressions, workspace, and more. For grades 6-9, pre-algebra, and algebra 1. Graph linear equations and determine the slope or the equation of a line. You can control the type of problems, number of problems, whether a fractional slope is allowed, workspace, and more. Free worksheets for pre-algebra, such as percent, exponents, angles, proportions, and more. Great and free worksheet maker software with nearly 7,000 built-in algebra and geometry questions. Free worksheets (PDF) for equations, exponents, inequalities, polynomials, radical & rational expressions and more. Interactive worksheets that are checked online for most algebra 1 topics. Generate worksheets for: linear equations, systems of equations, and quadratic equations. Hundreds of free PDF worksheets for algebra 1 topics, loosely based on the 2004 Prentice Hall Algebra 1 textbook. Compiled by Jason Batterson, an 8th grade, algebra, geometry, and MathCounts teacher. These free worksheets include a few topics such as calculations with polynomials, factoring, and graphing lines. A few free PDF worksheets for pre-algbera, algebra 1, and algebra 2, including word problems. Worksheets that integrate algebra skills with fun activities including sudoku, word finds, riddles, color patterns, crosswords, games, matching cards, etc. A subscription is required. An online calculator that solves equations and does all sorts of algebra and calculus problems instantly and automatically. An online step-by-step automatic math problem solver from basic math & pre-algebra all through calculus. This free version of Algebrator solves algebra problems online. It does not show the solution steps - for that you can purchase the full version. This is for teachers: compose complex math equations online, then save the image for your own use. Solve equations, inequalities, and systems of equations, simplify or factor expressions, and much more with this free online algebra solver. Software that includes a full graphing calculator, equation solver, triangle solver, unit conversion tool, linear algebra solver, and more. Price: free. Automatic calculators for simplify, expand, evaluate, equations, etc. Word story problem helper has solved examples. Forum for asking questions. Software that will solve and explain algebra and calculus problems step-by-step, both verbally and in written form. A free and commercial versions available. Free video lessons on graphing calculators, primarily the TI-84 and TI-Nspire, plus comparison reviews of popular grpahing calculators. This site has automated quiz and word problem generators for these types of common algebra word problems: two-number problems (sum & product known), consecutive integers, distance/time/rate, average/count, sum, markup, markdown, percent, percentage, two coins, and work word problems. You can generate just one practice problem and then see its step-by-step solution, or generate an online quiz that will be graded. A great selection of word problems for grades 5-12. A hint and a complete solution available for each problem. A collection of school algebra word problem solvers that solve your problems and help you understand the solutions. All problems are customizable, meaning that you can change all parameters. Search for number, geometry, probability etc. word problems and challenges. Includes solutions. Challenge your children with the same interesting math contests used in schools. Contests for grades 4, 5, 6, 7, 8, Algebra Course 1, and High School are available in a non-competitive format for the homeschoolers. The goal is to encourage student interest and confidence in mathematics through solving worthwhile problems and build important critical thinking skills. By subscription only. Includes algebra related games, e.g. Concentration Algebra, Pac Algebra, Noughts and Crosses Algebra. The cockroaches will move along a straight line. Your mission is to find the equation of the line in slope-intercept form, and then the cockroaches will be killed. Find the value of each of the three (or four) objects presented in the puzzle. The numbers given are the sum in each row or column. Find the value of a given object based on information provided by two scales. Levels 1 and 2 contain two scales. Level 3 is more difficult and has three scales. Defend Earth from deadly meteorites using missiles. A team of dumb scientists are on hand to suggest possible trajectories. Practice drawing lines, quadratic curves, and some harder curves using their equations. The game has many levels, and you can stay at the easier levels if you so wish. Don't listen to the dumb scientists' talk - they mislead you! Harold Jacobs algebra text combines real-life examples, carefully structured exercises, and humor to help students learn and remember. Read my in-depth review of this combo package, which I highly recommend! Foerster's algebra book is very comprehensive and logical, presenting concepts in a manner suitable for even self-study. The Home Study Companion makes teaching from it very doable for homeschoolers or parents. By The Math Forum, Drexel University. Read my review of these two refreshing algebra companions. These books are meant for pre-algebra and algebra students, respectively. Both are written in a warm, easy-reading style, with some cartoons in between and clear layout. Dr. Math® books are compiled from the best answers that real math teachers and tutors have written to students' questions over the years at the popular Dr. Math® website. This is not a textbook, nor does it have any exercises, but instead contains verbial, often humorous explanations of algebra 1 concepts for those who would rather hear or read math explained in many words, instead of in a few symbols. Algebra Unplugged also often explains the reasons behind some peculiar mathematical notations or terminology, and in general, tells the students WHY things are done the way they are done in your "Real Algebra Book". I enjoyed reading through it (see my review). By Edward Zaccaro - who has also written several excellent problem solving books. With his algebra book, you can understand algebra with the help of real-world examples, and realize that mathematics is more than basic facts and memorized procedures. It includes cartoons and little stories that help you remember the rules of algebra. A good textbook for the mathematically inclined students. For each topic, there are many example problems with detailed solutions and explanations, through which algebraic techniques are taught. The explanations often highlight ideas on best problem solving approaches, which is something you don't usually see in regular algebra textbooks. Includes a free algebra 1 textbook called Llevada's Algebra 1, downloadable as PDF files by chapter, containing over 6,000 exercises, plus over 70 videos with lectures and solved exercises. Complete free online algebra books from CK-12. Includes both English and Spanish versions.